Hathway has revised its entire broadband tariff lineup for subscribers in Hyderabad, removing FUP restrictions. With the latest revision, the ISP is now offering as high as 125Mbps speeds at an affordable monthly plan of Rs. 649. There is also a 25Mbps plan that comes at Rs. 399 per month. The new lineup has a total of six different monthly plans that carry names – Hero, Super, Lightening, Freedom, Thunder, and Rapid. The new move by the Mumbai-based company comes ahead of the expansion of Jio GigaFiber that is so far in its testing mode in the country but is promising to offer up to 1Gbps of speeds to take on the competition. Among other new plans, the ‘Thunder’ broadband plan that comes at a monthly charge of Rs. 649 offers 125Mbps speeds. It can also be availed with six-month subscription at Rs. 3,549 or 12-month subscription at Rs. 6,588. There aren’t any defined FUP restrictions. Hathway subscribers in Hyderabad can also opt for 100Mbps speeds through the ‘Freedom’ broadband plan at Rs. 599 per month. The same plan can be picked for six months at a one-time charge of Rs. 3,294 or for 12 months at Rs. 5,988. Similarly, there is a ‘Rapid’ plan with 80Mbps speeds at a monthly charge of Rs. 499, ‘Lightening’ plan with 75Mbps at Rs. 449, and ‘Hero’ plan with 50Mbps speeds at Rs. 499. Subscribers with low data usage can also pick the ‘Super’ plan that offers 25Mbps of speeds at a monthly charge of Rs. 399. This can be opted for six months at Rs. 2,399 or 12 months at Rs. 4,500. Just like the ‘Thunder’ broadband plan, the other five plans offered by Hathway in the Hyderabad city are listed with no FUP limits. It is worth noting here that as mentioned on the official Hathway listing, installation charges applicable on one-month plans and taxes are additional, as applicable. Also, plans are subject to area feasibility and may not be available in your region. Folks at TelecomTalk first reported the revised Hathway plans. 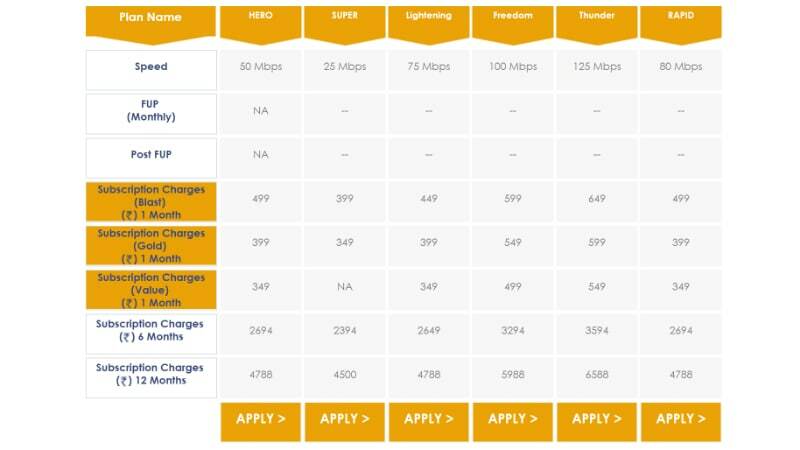 Hathway’s top plans offer speeds of 300Mbps, but these are yet to arrive in the Hyderabad city. Competitive ISPs, including ACT Fibernet and Spectra, on the other hand, are offering 1Gbps broadband plans for some time. Jio GigaFiber that is speculated to democratise the broadband sector is yet to arrive in many regions across the country, including Hyderabad. Nevertheless, last month, Reliance Industries (RIL) picked up a majority stake in Hathway and Datacom to bolster the Jio GigaFiber rollout.